I've had A Darker Shade of Magic on my to be read pile since it came out in 2015. I remember buying a copy in the bookstore after hearing all the hype and being sucked in to the first chapter when I sampled it. It languished on my shelves for long enough that I was able to buy the second book, A Gathering of Shadows, too. I told myself that I'd binge them once the third came out... but that was in February 2017. Story of my life, right? Finally, I put the first book on my June TBR. I started making seasonal reading lists for myself last year to tackle all my unread books, and I've only recently switched to monthly versions. It was the perfect motivation to finally start this series. And once I started, I couldn't stop! Since I read them all in four days, they've blended together a bit in my mind. So, I just decided to write about my overall thoughts on the series as a whole – with no spoilers, of course. 1. Developed Characters – If you love complex characters, you're in for a treat with this series! I hesitate to call it character driven because the plot is packed with action and adventure, but it certainly comes close. Delilah Bard was definitely my favorite, but I loved that each book gave me new people to root for and love. There's deep friendship, chosen family, slow-burn romance, villainous rulers... I mean, what more could you want?! 2. Creative World – In Schwab's fantasy world, there are four Londons: Gray London, Red London, White London, and Black London. Their names are associated with the state of magic in each, and only the Antari can travel between them. But happens when a bit of harmless smuggling opens the door to something dangerous? You'll have to read this series to find out! But, needless to say, I was fascinated by this setting and the creativity behind it. 3. 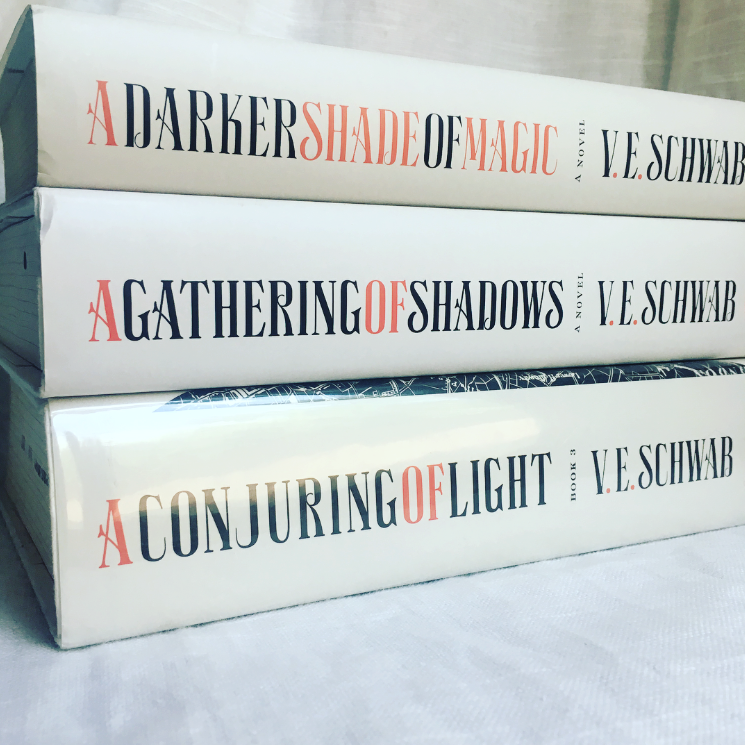 Engrossing Story – From the first chapter in A Darker Shade of Magic, I was hooked! I couldn't wait to see what would happen next. I loved that within the overarching conflict, there were lots of smaller moments that added to the sense of adventure. From ocean voyages to petulant kings, I'm still marveling at the richness of this story and world. I have a feeling these books just get better and better with every re-read and each new discovery! 1. Moral Dilemmas – There isn't a lot of black and white in this world, despite the names of the Londons. Characters face complex decisions that don't always have a right answer, and I appreciated the moral ambiguity. The book explores what happens when you do the wrong thing for the right reasons, and no one is immune from dealing with the consequences of their actions. I enjoyed the thought-provoking situations throughout the book. 2. Emotional Investment – This was a pleasant surprise because I didn't expect to be so emotionally invested in the series! Although I never reached the obsessive love that I've seen on Goodreads, I was so wrapped up in everything that was happening. And I'm so thankful that I waited to read this series until all of the book were released. The endings to the first two books might have killed me if I wasn't immediately able to pick up the next. 1. Unnecessary Length – There aren't many things that bugged me about the series, but I will say that the second and third books felt overly long at times. It affected the pacing a bit, though it's not a huge complaint. The third, in particular, felt crammed with information that sometimes seemed unnecessary or like it could have been introduced earlier in the series. And yet I still have a few lingering questions that I'd love to have answered! So, there you have it! I know I didn't really discuss many specifics about the plot or characters, but I honestly think it's more fun if you go into this series with no idea what's in store for you. I can see why these books were so hyped, and I'm glad I finally read them! If you're a fantasy reader, you don't want to miss this series. I finished these and immediately thought, I have a feeling I'll want to re-read these in the future. And that's high praise indeed! Love these books and 100% agree with your thoughts. I only managed to get through the third on audio...it was so big and heavy to read! lol.